Cassette Store Day: A look back to 1985 and the blank tape's heyday | What Hi-Fi? Remember when cassettes were the future of music? Yes, Cassette Store Day is a thing. Inspired by the popularity of Record Store Day, Cassette Store Day was concocted in 2013 to celebrate yet another retro format. But whereas the vinyl revival maintains a continued resurgence - with new turntables being produced every year and vinyl LP sales reaching 4.1 million in 2017 - cassette tapes haven't quite made the roaring comeback. Sales of cassette tapes doubled in the UK in 2017, and 18,500 tapes were sold during the first half of 2018. It's not a lot, but it's a surprising amount for a once-dead format. Invented by Philips in 1962, the compact cassette tape was originally meant for dictaphone use rather than hi-fi audio, but it quickly became the go-to analogue format of its time thanks to a mix of convenience, compact size and, of course, the ability to make mixtapes by recording music on to the tapes yourself. Recent movies such as Marvel's Guardians of the Galaxy (2014, 2017) heavily featured the original Sony Walkman and mixtapes (the soundtracks were also released on cassette) and trendy high street shops like Urban Outfitters are now stocking cassettes and faux-Walkmans alongside its vinyl LPs. It's no wonder that the cassette tape has had a boost in popularity in recent years. While Cassette Store Day (now in its sixth year and taking place on October 13th) is nowhere near as large a celebration as Record Store Day, it did make us nostalgic for the days when cassette tapes were the main way to listen to music. 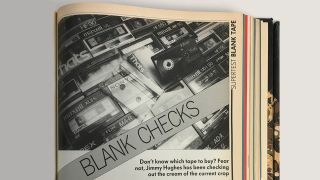 So we dug into our archives to the hi-fi heydays of the 80s and 90s when we used to test and review blank cassette tapes. That's right: Blank. Cassette. Tapes. This 28-strong supertest from 1985 featured tapes from manufacturers such as BASF, Maxell, Memorex, Sony, TDK and That's - all tested using a Nakamichi 681ZX cassette deck. "In this test, our tapes can be put into one of three categories: ferric, chrome (or pseudo-chrome) and metal. These words describe the magnetic coating that records the music. Generally speaking, metal is the best, followed by chrome/pseudo-chrome, and then ferric." We also note that it's important to make sure your chosen tape is compatible with your particular cassette deck, and that your purpose suits the tape. For instance, the simplest ferric tapes will record speech adequately, but music signals are more demanding - "so a high quality source needs an equally high standard of tape to capture every subtle nuance." Out of the 70 (70!) blank cassette tapes tested here in the September 1992 issue, the standout option is the TDK SA-X. For £2.36, it boasted "the widest dynamic range of any tape... the powerful and pin-sharp sound of SA-X makes it an ideal choice for the enthusiast. A natural partner for the exotic Nakamichis out there in hi-fi land." The tapes in this supertest were given an overall rating that took into account sound quality, compatibility and value for money, with prices ranging from 99p to £12. We were also extremely rigorous in our testing: "We asked tape manufacturers to supply us with samples of each of their single pack 90 minute tape formulations - we get five of each tape so we can be sure the results from each tape are representative. If we only tested only one sample of each tape, the possibility of a 'fluke factor' influencing our judgement would be high." The tapes in this supertest were given an overall rating that took into account sound quality, compatibility and value for money, with tapes ranging from 99p to £12. Alongside the tapes were hi-fi cassette decks - the pinnacle of which was the Nakamichi Dragon - and the iconic Sony Walkman TPS-L2, the granddaddy of portable music players and a firm fixture in pop culture. Sony started the personal stereo craze with the Walkman's introduction in 1979, and it's no stretch to say that the MP3 players and hi-res portable music players of today can trace their lineage back to this compact blue and silver box. The original Walkman featured stereo playback, ran on two AA batteries, and had two mini headphone jacks so two people could listen at the same time (even though it came with only one pair of MDR-3L2 headphones). Will cassette tapes ever enjoy the widespread popularity of vinyl again? We doubt it. Sure, certain generations will fondly remember poking a pencil or their finger into the reel holes to manually rewind a tape, and Spotify playlists aren't quite as personal or customisable as a mixtape with a handwritten tracklist. Because while cassette could sound surprisingly good with a really capable deck, it's still a heavily compromised analogue medium in the way MP3 is a heavily compromised digital medium. Vinyl can justify its premium cost thanks to fantastic audio quality (with the right pressing and the right kit), but cassettes were never really about attaining the best sound quality.